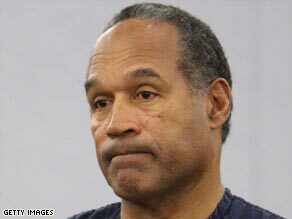 LAS VEGAS, Nevada (CNN) -- Former gridiron great O.J. Simpson will serve at least nine years in prison for his role in an armed confrontation with sports memorabilia dealers in a Las Vegas hotel in 2007. O.J. Simpson told the judge Friday that he was sorry for what he did but didn't think it was wrong. Simpson was sentenced to a maximum of 33 years with the possibility of parole after nine. Before the sentence, he offered a rambling, emotional apology in which he told District Judge Jackie Glass, his voice shaking, that he was sorry for his actions but believed he did nothing wrong. Glass, however, brushed his apology aside, saying his actions amounted to "much more than stupidity," and calling him both arrogant and ignorant. "Earlier in this case, at a bail hearing, I said to Mr. Simpson, I didn't know if he was arrogant, ignorant or both," Glass said. "During the trial and through this proceeding, I got the answer, and it was both." Grimacing, Simpson was escorted from the courtroom in shackles. Defense attorneys said Glass' sentence was appropriate. "It could have been a lot worse," Yale Galanter said, noting that Simpson and co-defendant Clarence "C.J." Stewart both could have been sentenced to life in prison. A jury convicted Simpson, 61, and Stewart, 54, on 12 charges including conspiracy to commit a crime, robbery, assault and kidnapping with a deadly weapon stemming from a September 13, 2007, incident at Las Vegas' Palace Station hotel and casino. Prosecutors alleged that Simpson led a group of men who used threats, guns and force to take sports memorabilia from dealers Bruce Fromong and Al Beardsley. Simpson claimed that he was attempting to recover items that belonged to him. All the men except Stewart made deals with prosecutors in exchange for their testimony. "We're happy that this case is coming to an end," Clark County district attorney David Roger said. "We're satisfied that we presented a good case to a jury, that the jury listened to all the evidence, particularly the audiotapes, and came to the resolution that we asked them to come to." He said he thought the sentence was fair. Glass said, "I'm not here to sentence Mr. Simpson for what's happened in his life previously in the criminal justice system. ... The jury decided. There are many people who disagree with that verdict, but that doesn't matter to me." Goldman's father and sister were in the courtroom for Friday's sentencing. "The back of his head looks the same as it did every day that we watched him in the criminal case, and we feel very proud of our efforts," Kim Goldman said. "We feel very strongly that because of our pursuit of him for all these years, that it did drive him to the brink of this." Although Simpson was acquitted in the deaths, a civil jury later found him liable, slapping him with a $33 million judgment. Attorneys for the Goldman family have doggedly pursued Simpson's financial assets to pay the judgment. Galanter said he thought the Goldmans' presence was "inappropriate." "I don't think they should have been here," he said. "It reminded us all how the criminal justice system can run afoul, because the only thing Simpson should have been judged on is what happened here in Nevada." Denise Brown, the sister of Nicole Brown Simpson, issued a statement on the sentence saying, "It is very sad to think that an individual who had it all, an amazing career, beautiful wife and two precious children, has ended up like this. "Allowing wealth, power and control to consume himself, he made a horrific choice on June 12, 1994, which has spiraled into where he is today." Brown said she was saddened that the couple's two children "once again face the tragedy of yet another parent absent in their lives." In the statement, she asks for prayers for the children, Sydney and Justin, and the Brown family. "I just wanted my personal things. I was stupid. I'm sorry," Simpson said. "I didn't know I was doing anything illegal. I thought I was confronting friends. I thought I was retrieving my things. I didn't mean to hurt anybody, and I didn't mean to steal anything." But Glass rejected those statements in imposing the sentence. "When you take a gun with you and you take men with you ... in a show of force, that's not just a 'Hey, give me my stuff back,' " Glass said. "That's something else. And that's what went on here, and that's why we're all here. "I have to tell you, it was much more than stupidity. ... You went to the room, you took guns -- meaning you and the group -- you used force, you took property, whether it was yours or somebody else's, and in this state, that amounts to robbery with the use of a deadly weapon." Simpson's attorneys asked that he be sentenced to no more than six years. A presentencing report recommended an 18-year term. Stewart received a sentence similar to Simpson's but will be eligible for parole in 7½ years. "I am as happy as someone could be when they know their client is going to reside for at least seven years in a cage," said Stewart's attorney, Brent Bryson. Defense attorneys for both Simpson and Stewart have said they will appeal. On Friday, Glass denied motions asking that both defendants be allowed out on bail while the appeal is pending.